Before We Begin, What Is "OTS" Again? "OTS" stands for "On the spot queen rearing" as coined and discovered by Mel Disselkoen. You can buy his 2016 book on the subject here. Essentially, Mel discovered that you can easily direct the bees to raise queen cells on any frame with 36-hour or younger larvae by moving the queen to another hive and notching below said larvae. The original now-queenless colony will quickly raise high-quality queen cells you can use to requeen or increase your colony count. And, Tell Me Again: Why Does OTS Work? I've personally seen OTS prove itself time and again among beekeepers of all ages, experience-levels and skill. It just works. In fact, it's so simple, many beekeepers refuse to believe its merits and some even disparage the idea. But, for those of us "OTS-ers" who maintain and grow apiaries, sell bees and honey year after year... well, we KNOW it works! OTS is done right at the hive, in your apiary, when you're ready. It is very quick and simple, with the initial notching and splitting done in a few minutes per colony. No tools or fancy equipment are needed to notch ― just bring your basic hive tool or use a small stick, for that matter! OTS is so simple, in fact, anyone can do it with little training ― all that is required is a basic understanding of what a newly hatched larva looks like and how to notch just below the larva. You are essentially raising your own local survivor stock ― as Mel likes to say, "The best bees are the bees you can raise in your own yard!" OTS queen rearing means you will likely never touch the queen from egg to laying. Your queens will never be caged, handled or shipped. OTS, done at the right time, will control swarming. The process of raising queens with OTS requires a brood break which also breaks the mites breeding cycle ― your bees can then outbreed the mites and have healthier bees going into winter, less damaged by large mite populations and the diseases they vector. Young overwintered queens you raise in the summer will explode the following spring when colonies begin to expand again. With OTS, you will never need to buy bees again! Only healthy colonies with substantial resources can raise strong queens ― This applies to any queen-rearing method. Unless you have healthy bees to begin with, you can't expect success. Only work with strong healthy colonies that have plenty of resources and break up the weak (the sooner the better). At a minimum, a strong colony in early Spring would need at least 5+ solid frames of capped brood, all covered with bees and 2-3 frames of honey and pollen. I would hesitate to raise queen cells on anything weaker than this. Strong hives must always do the work of building cells ― A key mistake I see often repeated among new beekeepers is asking small nucs to build cells. It just doesn't works. You end up with small, immature queens that often won't even get mated. 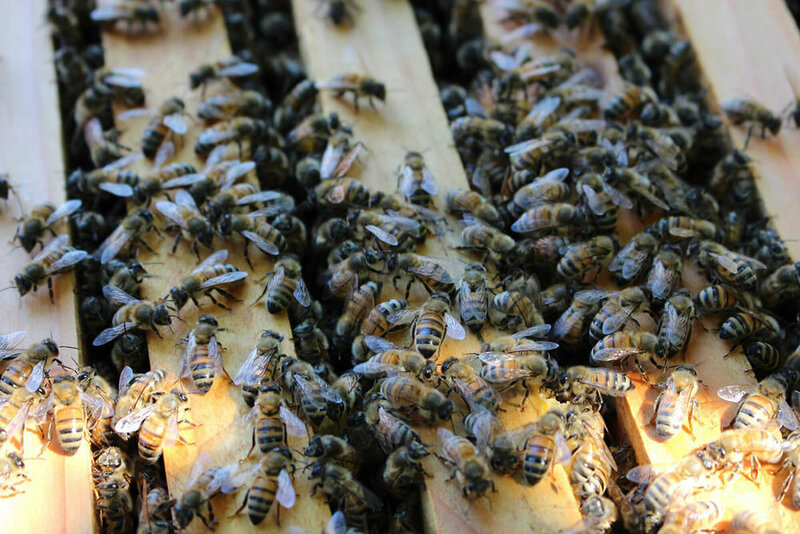 When doing OTS properly, the original queen is removed along with a couple frames of brood and bees (that's it!) with a frame or two of honey and placed in it's own box. The original colony, now queenless, is the only colony strong enough to raise queen cells, having 4 or more frames of brood, lots of bees and resources. This original colony only is tasked with raising cells. Notch one or more frames with larva and then come back a week later and cull cells down to just the largest 2. If you are wanting to make splits, you would break this remaining colony further into 2 or 3 colonies, each with a frame that includes a queen cell, with the bees and resources evenly distributed amongst them. Getting the 2-step, 1-week process down: Notching one weekend and culling / splitting the next. ― Beekeeping has much to do with timing. Some things, like raising queens, you just can't forget or miss. I like doing OTS on Saturdays which makes things simple. On the first Saturday I remove the queen and notch frames. Exactly one week later, on Saturday, I come back and cull cells, leaving only 2-3 cells in any colony. I then do any splitting desired, with each split getting 1 frame with a couple cells. Two key times to notch: Early spring to control swarming (vital! ), early summer for increase, new queens and breaking mite cycle. ― The first notching time is vitally dependent on weather and your locale. Talk with at least 2-3 old-time beekeepers in your county and find out when they think swarming season is and ask them again when it's getting close. You want to notch ONE WEEK before swarming begins. Too soon and it might be too cold or not enough resources. Too late and your colonies may already be in swarm mode which is another blog post for another time. Bottom-line: you don't want to lose your dollars and time with swarming bees. The second notching time would be around solstice (June 21) give or take a week. At this time, all queens in my yard are replaced. That's right, all of them. This will force every colony in the yard to endure a 25-30 day brood break which has both pros and cons. The pros far outweigh the cons from my experience. I time this break to take advantage of the Basswood flow in my neighborhood. With no brood to raise, the colonies can fill a box in a good year. As well, this broodless period breaks the mites reproductive cycle and allows the bees to stay ahead of them. You will see about 10-15% mating failures which is the case for anyone raising queens. Those bees can be reincorporated back into your other colonies. Always cull notched frames down to 2 cells ― It's another common mistake to see folks letting a dozen queens fight it out in their colonies which can lead to dead or weakened queens. Do the work for them and cull the cells down to just 2-3 cells per colony that are raising queens. I personally select for the largest cells that appear to have the most royal jelly in them, and cut out any small, weaker-looking cells quickly with my hive tool. Let your queens expend their energy and time on maturing and mating flights, not duking it out. Be ruthless with weak or laying worker hives ― don't waste your time, instead make use of the resources. Many beekeepers spend countless hours and days trying to prop up weak or queenless colonies. With OTS, you'll have more colonies than you know what to do with, allowing you to be ruthless with under-performing, weak or laying worker hives. I have zero tolerance now for weak colonies and break them up, distributing the comb and resources to other colonies. It saves time, money, headache, and makes for more enjoyable beekeeping. As well, your investment will be in strong genetics and bees, rather than propping up weak genetics. Enough boxes and frames on hand in advance ― the problem with OTS is no longer losing bees, but having enough equipment prepped in advance. I find that I need to plan ahead and have more frames and boxes than I thought I might need. Think about it ― with OTS, you can reasonably expand every colony in your yard at least 5 times per season. That's right, five times. For example, this year (2017) in my home apiary, I took 11 overwintered colonies and expanded to over 60 colonies, selling 16, giving my son 10, and will over-winter 30+ colonies. I intentionally don't sell much honey because I like to raise and sell bees. But if I did, I would re-combine some of those splits into big honey hives at the right time to capture nectar flows in our neighborhood. I trust this will be of help to some. Feel free to ask any questions on this pots or join the OTS Beekeeping group on Facebook and chat with the community anytime.